The Hanen Centre’s® It Takes Two to Talk® program is designed to help parents learn techniques to increase their child’s communication skills. 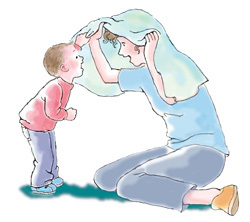 The Hanen Centre’s® More Than Words® program is designed to help parents learn techniques to increase their child’s social communication Costskills. Ask questions or enroll by calling me at (505) 375-0211 or emailing me at AmyS.SLP@gmail.com. Cost: $400 per family (up to 3 parents & caregivers) – can be paid in increments. For: Parents & caregivers of children who are experiencing communication delays and using phrases shorter than 4 words-in-length. Interested? CLICK HERE to download an intake form then send it back to me. Due to low demand, these sessions are now being offered as individual sessions with your child present. I will demonstrate the use of the strategies with your child so that we can problem-solve their use together.